Susan Elaine Eisenhower (born December 31, 1951) is a consultant, author, and expert on international security, space policy, energy, and relations between the Russian Federation and the United States of America. She is the daughter of John Eisenhower, and the granddaughter of President Dwight D. Eisenhower. Eisenhower is President of the Eisenhower Group, Inc, which provides strategic counsel on political, business, and public affairs projects. She has consulted for Fortune 100 and Fortune 500 companies doing business in the emerging markets of the former Soviet Union and for a number of major institutions engaged in the energy field. She is also Chairman of Leadership and Public Policy Programs and Chairman Emeritus of the Eisenhower Institute, a think tank based in Washington, D.C. and in Gettysburg, Pennsylvania, owned and operated by Gettysburg College. Eisenhower served as the president of the Eisenhower Institute twice, and later as Chairman. During that time, she became known for her work in the former Soviet Union and in the energy field. In January 2010, Secretary of Energy Steven Chu appointed Eisenhower to serve on the Blue Ribbon Commission on America's Nuclear Future, which has been asked to develop a long-term solution for safely managing the back end of the nuclear fuel cycle. Over the years, Eisenhower has served on many other government task forces. In 2000, she was appointed by United States Secretary of Energy Bill Richardson to the Baker-Cutler Commission, a blue-ribbon task force, to evaluate U.S.funded nonproliferation programs in Russia. Since that time, she has also served as an advisor on two other United States Department of Energy studies; one on the threat of nuclear terrorism and the other a blue-ribbon panel on the future of nuclear energy. In 2001, after two terms on the NASA Advisory Council, she was appointed to the International Space Station Management and Cost Evaluation Task Force, which analyzed ISS management and cost overruns. She currently sits on the Nuclear Threat Initiative board, co-chaired by Senator Sam Nunn and Ted Turner, the Energy Future Coalition, the US Chamber of Commerce's new Institute for 21st Century Energy, and the Air Force Academy's Eisenhower Center for Space and Defense Studies. In academia, she is a current External Advisory Board Member of the MIT Energy Initiative. She has also served as an Academic Fellow of the International Peace and Security program of the Carnegie Corporation of New York, as director of the Carnegie Endowment for International Peace, and as an advisor to Johns Hopkins' Nitze School of Advance International Studies. Eisenhower testified before the Senate Armed Services and Senate Budget Committees on policy toward the region. She was also appointed to the National Academy of Sciences' standing Committee on International Security and Arms Control, where she served for eight years. Susan Eisenhower is also active in the corporate world, serving on the advisory boards of Thorium Power, IxReveal, and Foolproof. She is also a Senior Director of Stonebridge International, a Washington-based international consulting firm headed by former national Security Advisor Samuel "Sandy" Berger and former Senator Warren Rudman. She has provided analysis for CNN International, MSNBC, The Situation Room with Wolf Blitzer, Fox News, The Newshour with Jim Lehrer, Hardball with Chris Matthews, One on One with John McLaughlin, the BBC, and three network morning programs. Over the years, she has appeared on many other programs, including Nightline, World News Tonight with Peter Jennings, This Week with David Brinkley, and CBS Sunday Morning with Charles Kuralt. Eisenhower has spoken at many diverse types of gatherings: from the nation's most distinguished institutions such as Harvard to countless World Affairs Councils and corporate gatherings. She has also spoken to many expert audiences. For instance, she gave the Commandant's Lecture at the Army War College in Carlisle, the Harry S. Truman Distinguished Lecture at Sandia National Laboratory, and she delivered the 2008 Rose Lecture at MIT. She has also given full speeches, by invitation, at other prominent places, such as the National Press Club, the Smithsonian Institution, the National Archives, the Hollywood Bowl, the French National Assembly, the Rotunda of the Capitol, and the White House, on two recent occasions. Eisenhower has also been seen as a "talking head" on many TV programs and documentaries, including Oliver North's War Stories, Sony Pictures Why We Fight and, most recently, Sputnik Mania. She has received four honorary doctorates, most recently from the Monterey Institute, where she was cited for her work on nuclear nonproliferation. Eisenhower received the 2008 Dolibois History Prize from Miami University. She was a keynote speaker at the 2012 Washington & Jefferson College Energy Summit, where the Washington & Jefferson College Energy Index was unveiled. Eisenhower has written extensively on nuclear and space issues. She is the author of three books: Breaking Free: A Memoir of Love; Mrs. Ike: Memories and Reflections on the Life of Mamie Eisenhower; and Partners in Space: US-Russian Cooperation After the Cold War. She has also edited four books on regional security issues; the most recent – Partners in Space (2004) – was also published by Nayuk, the publishing house of the Russian Academy of Sciences. In 2000, she co-edited a book, Islam and Central Asia, which carried the prescient subtitle An Enduring Legacy or an Evolving Threat? She has written chapters for a number of collected volumes, and penned hundreds of op-eds and articles on foreign and domestic policy for the Washington Post, Los Angeles Times, United States Naval Institute's Proceedings, The Spectator, the National Interest, Politique Americaine, USA Today and other Gannett Newspapers. 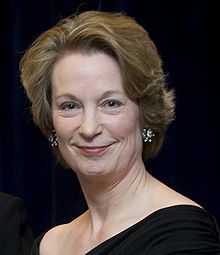 Susan Eisenhower also actively maintains a blog on her personal website, addressing various issues in foreign and domestic policy, national security, and politics. Although a lifelong member of the Republican Party, Eisenhower endorsed Barack Obama for president of the United States in 2008. Eisenhower announced on August 21, 2008 that she was leaving the Republican Party and becoming an Independent. She spoke on the final day of the 2008 Democratic National Convention. Her speech was delivered at INVESCO Field at Mile High in Denver, Colorado, and began with, "I stand before you tonight not as a Republican or a Democrat, but as an American." The full transcript of her remarks as delivered is on her website. On October 29, 2012, she re-endorsed Barack Obama for a second term in the 2012 presidential election. Her father, John Eisenhower, had similarly left their family's traditional party in 2004 to become an Independent; he endorsed Democratic candidate Senator John Kerry for president. Susan Eisenhower, along with the rest of her family, has stated her opposition to architect Frank Gehry's proposed design for the Dwight D. Eisenhower Memorial. She objects to the negative symbolism associated with the 80-foot-high metal curtains and takes issue with the design's overall depiction of President Eisenhower as a young boy rather than a man. In her testimony to Congress on the matter, she said, "The Eisenhower Memorial can and should be a reflection, not only of Eisenhower's lifetime achievements, and the challenging and dangerous times in which he led us; it should also be anthem to our national purpose." Eisenhower has been married three times, first to Alexander H. Bradshaw, a London barrister, with whom she has two children, secondly to John Mahon, an American lawyer, with whom she had a daughter, Amelia Eisenhower Mahon, and finally to Russian space scientist Roald Sagdeev, formerly the director of the Russian Space Research Institute, Hero of Socialist Labor, and pro-democracy advocate. In 1970, Susan Eisenhower was presented as a debutante to high society at the prestigious International Debutante Ball at the Waldorf-Astoria Hotel in New York City. Many members of the Eisenhower family have been presented as a debutante at the International Debutante Ball. ^ "Plan your next trip with the National Trust - National Trust for Historic Preservation". Retrieved 26 April 2018. ^ Joselow, Gretchen Cook, Thea. "NPR : Susan Eisenhower, National Press Club". www.npr.org. Retrieved 26 April 2018. ^ Krebs, Alvin (1979-11-02). "Mamie Eisenhower Dies in Sleep". New York Times. Retrieved 23 March 2019. ^ a b c d e f g h i "SusanEisenhower.com". SusanEisenhower.com. Retrieved 26 April 2018. ^ a b c "Eisenhower Institute at Gettysburg College - Susan Eisenhower, Chairman Emeritus". www.eisenhowerinstitute.org. Retrieved 26 April 2018. ^ "Eisenhower and Clift Headline first W&J Energy Summit" (PDF). W&J Magazine. Washington & Jefferson College. Summer 2012. p. 11. Retrieved December 16, 2012. ^ "The National Interest". The National Interest. Retrieved 26 April 2018. ^ a b "SusanEisenhower.com". SusanEisenhower.com. Retrieved 26 April 2018. ^ "Why I Am Endorsing President Barack Obama". 29 October 2012. Retrieved 26 April 2018. ^ Eisenhower, John (2004-09-28). "Why I Will Vote for John Kerry for President". The Manchester Union Leader. Archived from the original on 2006-12-15. Retrieved 2007-05-19. ^ a b "My Testimony to Congress on "The Proposed Dwight D. Eisenhower Memorial"". 20 March 2012. Retrieved 26 April 2018. ^ Services, From Times Wire (5 January 1990). "Ike's Granddaughter to Wed Soviet Space Scientist : Nuptials: Susan Eisenhower and Roald Sagdeev plan to maintain homes in Moscow and Washington". Retrieved 26 April 2018 – via LA Times. ^ "After Glasnost, Romance: a Russian Scientist Marries Ike's Granddaughter Susan". Retrieved 26 April 2018. ^ ""Leadership in Conflict"". Samford University. Retrieved 26 April 2018. ^ Sagdeev, Roald (1994). The Making of a Soviet Scientist: My Adventures in Nuclear Fusion and Space From Stalin to Star Wars. Wiley. ISBN 0471020311. ^ Times, NY. "Eisenhower Gathering Marks Debutante Ball". New York Times. Retrieved 12 June 2018. Wikimedia Commons has media related to Susan Eisenhower. This page was last edited on 23 March 2019, at 18:23 (UTC).